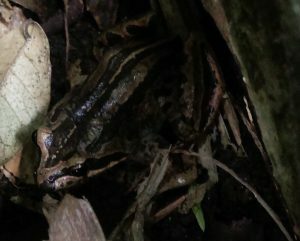 Striped marsh frogs are small, about 60-70mm long. Their backs are golden or light brown, with distinctive dark striping, and they have almost no webbing between their toes. They are the most common frog on the Australian eastern seaboard, known both for their adaptation to polluted and urban environments and for a voracious appetite and a fast breeding pattern that drives other frogs from shared habitat. At the height of breeding and egg-laying seasons, in Spring and Summer, it is common to hear several males calling from each pond. They each make a loud and distinctive ‘thook’ sound which they repeat every few seconds, for hours, day and night. 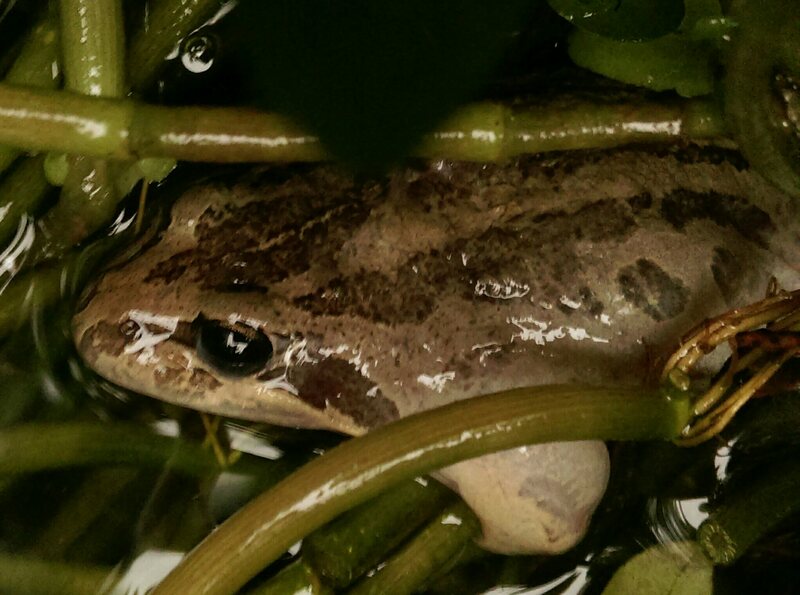 If several frogs are present, they coordinate their calls, taking turns in what I assume is a competitive sequence. When you approach the ponds they become silent, but, if you then remain still for two minutes, the croaking starts again. Some people find the sound reassuring, but it can disturb your rest if your mind fixes on the jagged patterns. A few years ago we were woken at 2am by angry neighbours who had just moved to Newtown from a country town on the Murrumbidgee River. They demanded to know what loud noise we were making every night. They hadn’t heard frogs before. On many mornings in summer, you will find in each pond one or two, or even three or four, bubble rafts. 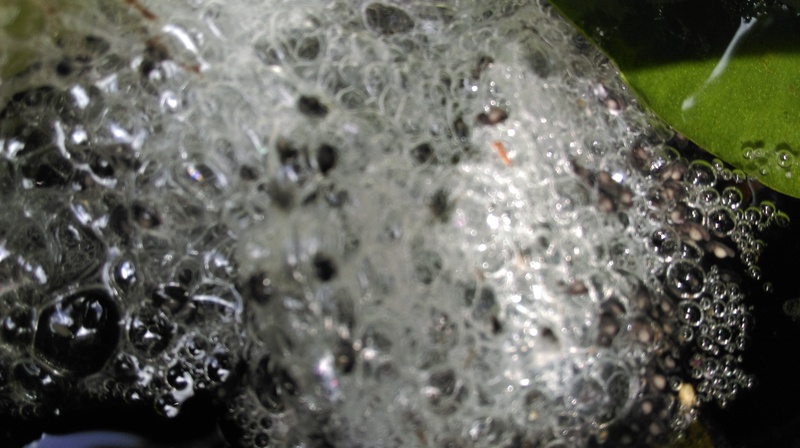 There are up to 1000 frog eggs in each raft, and they are protected from the goldfish by being laid in the middle of the water weeds. On the first morning the bubbles are almost clear but in the next days the tiny tadpoles become visible. Within three or four days the rafts have collapsed and the tadpoles have hatched and disappeared, either eaten by fish or in hiding at the bottom of the pond. I only catch sight of them again months later, when they have grown to three centimetres. 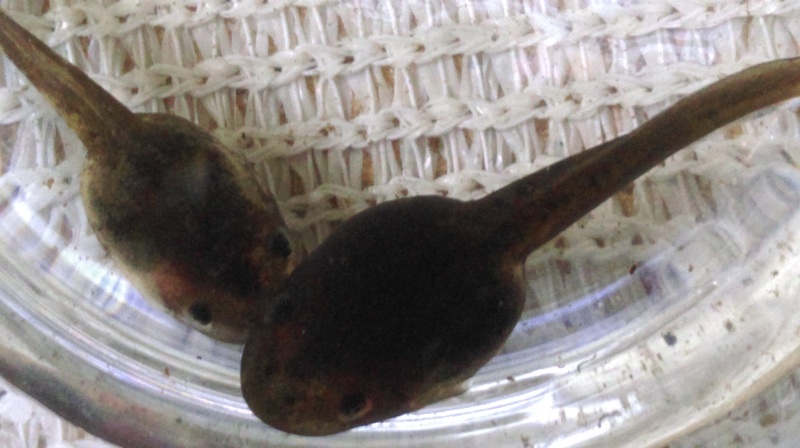 In autumn this year it was possible to push a sieve anywhere into the bed of water weeds in the top pond and bring out one or two of these well-developed tadpoles. 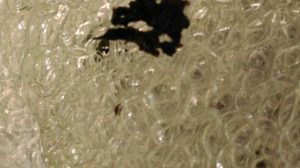 By this stage, you can clearly see lineaments of the frog they will become, but the whole process of maturation can take a year. Although the frogs croak incessantly at certain times of year, you need to be lucky or knowledgeable to see them during the daytime. They hid e in the leaf litter and the crevices of the bush rocks that surround the lower pond, and around the top pond they hide in the water weed, in the leaf litter under the low pittosporum hedge, and under paving bricks that have been lifted by tree roots. It is a different matter at night, however, when they can be so common, and hard to see, that you have to be careful where you step. Cats and carnivorous birds must know of their existence, but in the day they are hard to find and at night, fortunately, most cats seem to be kept indoors. As I was typing this post, I realised that it is a week or so since I last heard a frog. As it is now winter, I wondered if they had started their hibernation. So I have just been to the top pond, where I gently lifted a corner of the blanket of water weed. 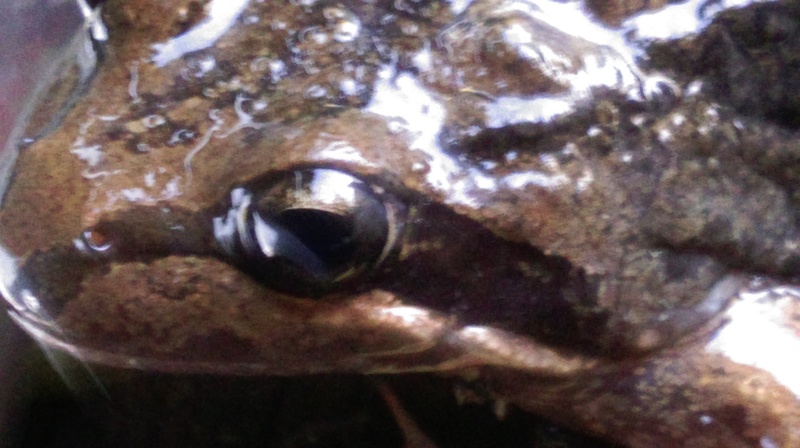 In the darkness of the water underneath, I could see, facing me, two dark eyes and the tip of a snout. And then, leaving barely a ripple, they were gone.